Spix's Macaw -Cyanopsitta spixii. What do we know today about this rare bird? A report on field work carried out from 1985 to 1988 by Dr. Paul ROTH published in "Papageien" (Issues 3/90 and 4/90), translated from the German by Tony Pittman for Cage & Aviary Birds. The zoologist Johannes Baptist von Spix and the botanist C.F.P.Martius, both working with the Bavarian Museum in Munich, travelled thoughout Brazil from 1817 to 1820, visiting also the north-eastern parts. In 1819 von Spix collected a specimen of a macaw unknown until then in the region of Juazeiro, Bahia. In 1832 the German biologist J.B.Wagler named this macaw species " Sittace spixii" after its discoverer. TheSpix's Macaw is one of the least known parrots in the neotropical region. With a total length of just under 60 cm, it is one of the medium-sized species. Its body plumage is grey-blue, the forehead and sides of the head are greyer, the wings cobalt blue. The extremely long tail and comparatively small beak for its size are noticeable. Because of its general blue colouring many experts regard the Spix's Macaw as being closer to the macaws of the Anodorhynchus group (Hyacinthine, Glaucous and Lear's Macaws) or as a link between this group and the remaining macaw species. However if the body proportions of the Spix's Macaw and its known habits are considered, these theories cannot be supported. This macaw is surely in a species group of its own. After its discovery by von Spix, there was no further information about the species until 1903, when Reiser was able to observe some of them on two occasions ( three individuals on 18th and two on 21st June, 1903) in the area of Parnaguá, Piauí. According to his report he was unable to collect a specimen despite all his efforts, because the three birds, who came to drink at the Lagoa of Parnaguá, were extremely shy. Following Reiser's observations almost no further information was available on their life and habits in the wild. The distribution of the Spix's Macaw is given in literature as follows: North-east Brazil in southern Piauí (Parnaguá) and north-east Bahia (Juazeiro). It is supposed to be present in the southern most corner of Maranhão (Sick and Teixera 1979) and north-east Goiás (Ridgely 1981) and possibly also in Pernambuco. Within its distribution area it only occurs locally and irregularly. It is supposed to prefer palm nuts, especially those of the Buriti palm (Mauritia flexuosa). ( Meyer de Schauensee 1971, Sick 1985). 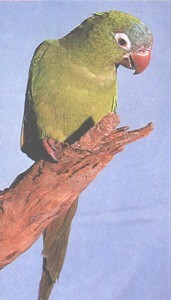 Sick and Texeira (1979) included the species in their " List of rare and endangered birds of Brazil." It is listed by CITES in Appendix I. 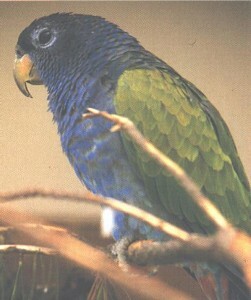 The Spix's Macaw is seldom found in captivity. It is present in very few zoos or bird parks in Europe. Most bird enthusiasts know this rare bird only from illustrations or photographs and have never had the opportunity to see it in the flesh. The almost complete absence of information about the Spix's Macaw led me to start up a project to investigate this macaw species, when I was in Maranhão in north-east Brazil in 1983. After several unsuccessful attempts, we finally started out in June/July 1985 with the support of the Pan-American section of the ICBP on our first expedition to the area thought to be inhabited by the Spix's Macaw. In the years 1986 to 1988 there were follow-up expeditions and we obtained the additional support of the Zoological Society for Species Conservation in Munich, the Brazilian IBDF ( Instituto Brasileiro de Desenvolvimento Florestal) and the US branch of the World Wildlife Fund. The objective of the expedition was to collect information about this rare macaw. In particular it was vital to obtain more biological data, ascertain actual distribution and population size in order to take the necessary measures to protect it. It was absolutely necessary to collect information about its habitat and feeding habits as well as establish whether the species was actually as rare as the sparse references in literature would suggest. Direct observation of the Spix's Macaw in the wild is naturally the best evidence of its occurrence in a given region and we always used the early morning and late afternoon periods - virtually the only times in the tropics in which birds are active - during our journeys for ornithological observations. However as direct observations are extremely unlikely with such a rare species as the Spix's Macaw without very precise information, we spent the rest of the time questioning the local people about occurrence of the Spix's Macaw and other parrot species as well as birds in general. We endeavoured to keep our questions as general as possible in order to keep information given about Spix's Macaws in perspective, thus allowing better evaluation. Our first expedition in 1985 took us into the south of the state of Maranhão and the bordering region of Piauí. During this journey we obtained information about the possible occurrence of the Spix's Macaw in the region of Juazeiro in Bahia. As a result we visited the area of Juazeiro in our second expedition and in 1986 and 1987 actually had several opportunities to observe the last remaining birds of this population. When we received the first reports of this population in 1985, there was talk of five remaining individuals of a previously strong local population. 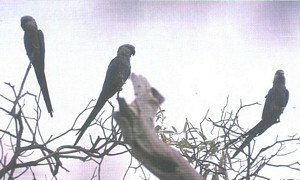 We only observed three Spix's Macaws in our first direct contact with the birds in May 1986. Two were sighted from May 1987 onwards, but these were captured by a trapper from Petrolina at the year end 1987/8. As these trappers are not exactly gentle in their operations and they penetrated the area on this occasion with a band of armed men, none of the local people employed by us as look-outs dared to interfere. Unfortunately the contact personnel at the IBDF in Brasilia could not be reached between Christmas and New Year. According to information we received from the older people in the region, this particular population of Spix's Macaws consisted of 30 or more pairs at the beginning of the century. The birds lived in the region east of Juazeiro in the Curaçá area, along several small tributaries of the Rio São Francisco and were even supposed to have visited the banks of this great river on occasion. There were good reasons for believing that the first specimen collected by von Spix, which was found along the Rio São Francisco, belonged to this population. There was no doubt that young birds were taken occasionally to rear them in captivity. This had however done no real harm to the still substantial population. Then in the sixties and seventies a few specialist trappers began to increasingly plunder the population and the absurd prices offered for this species on the " market " ensured that the last remaining survivors were captured. The hunting activities of the local people throughout Brazil is very intensive. Anything that can be eaten is taken and in addition a whole range of animals are killed for sporting pleasure. It is highly likely that several Spix's Macaws fell victim to this. Certainly one of the five remaining birds in 1985 died in this way. However these casualties were more or less accidental and could hardly have been a determining factor in the downfall of this population. The introduced African bee occupies hollows in trees and cliffs. In the region of Curaçá, they could have been in competition with the Spix's Macaws or even have driven them out of their nesting sites. The trappers concerned reported that the breeding successes of the Spix's Macaws in the last years were very low and blamed the African bees. It is known that when the introduced bees enter a new area, they are especially aggressive. During their initial phase in the Curaçá area these " killer bees " are supposed to have attacked breeding Spix's Macaws in their nest holes and even killed some of them. Without doubt the bird trade was the most important threat and this factor irrefutably led to the extinction of the population. At the beginning of the century Reiser had seen a Spix's Macaw in captivity. Some are believed to have left Brazil for the first time in the twenties and made their way to Europe or the USA. (Low 1972) At this time young birds were taken occasionally. The relentless decline of the population began, however, in the sixties and seventies when specialist trappers began to take young birds systematically and later adult birds. 1977-84 According to the locals and the trappers more than 9 birds were taken between 1977 and 1984. 1984-5 From information received from the trappers, 10 to 12 birds were taken, including at least 7 adult birds. 1985 Five birds still remained. One Spix's Macaw was killed by a rancher (fazendeiro) according to the local people. 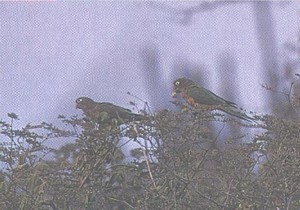 1986 When we arrived for the first time in the Curaçá area, there were still three Spix's Macaws remaining. 1987 Up to April three birds were sighted, but from May onwards only two. We could obtain no information about the fate of the third bird. 1987-8 A few days before Christmas 1987 a trapper from Petrolina caught one of the remaining two birds and according to telephoned information from the local people the very last member of this Spix's Macaw population was caught by the same trapper in the first few days of 1988. As already mentioned in the introduction, the habitat of the Spix's Macaw was recorded as palm groves ( Meyer de Schauensee 1971) or, more specifically according to Sick (1985), stands of buriti palms (Mauritia flexuosa). This was not true for the population in the region of Juazeiro/Curaçá, since there were hardly any palm trees in the area. Juazeiro is located in an arid part of north-east Brazil. 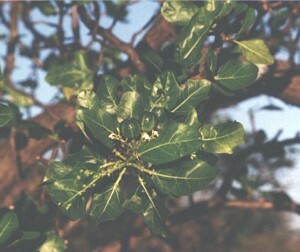 The natural vegetation is typical of a thorn bush scrubland called " caatinga ", characterised by the predominance of Euphorbiaceae ( giant succulents), of which "faveleira", (Cnidoscolus phyllacanthus) and the "pinhão" (Jatropha pohliana) are important. Other characteristic plants of this type of caatinga include the " catingueira " ( Caesalpinia sp. ), the " joazeiro" (Ziziphus joazeiro) and various cactus such as the " facheiro " (Cereus squamosus), the " Xiquexique " ( Pilocereus gounellei) as well as diverse Opuntia types. This vegetation occurs in wide areas of north-east Brazil. * The region of Curaçá, in which the Spix's Macaw lived, has a considerable number of water courses, which dry out seasonally. tall trees grow along these in contrast to the typical surrounding caatinga vegetation. The most common of these trees is the " crabeira " (Tabebuia caraiba.). As our observations showed, the water courses with the tall craibeira trees were of vital importance for the Spix's Macaws. The birds could be regularly observed along these streams. The last three birds in the population were to be mainly found along the Melancia river. There they chose the highest, most prominent, most dry and least leafed branches of several craibeiras, which were not traditional perching sites. From there they had a wide view and if approached they flew a considerable distance away. In flight their relatively slow, deep wing strokes resembled those of the larger macaws. Because of this, there was little difficulty in telling them apart from the smaller, faster flying Illigers macaw (Ara maracana), which lived in the same area. The Spix's Macaws flew mostly high over the vegetation and during flight gave off a fairly regular " kra-ark" cry. In the Curaçá region the Spix's Macaws spent part of the day on their perches along the water courses, flew away to feed and were then occasionally seen at some considerable distance from their usual resting places. According to information received from the local people, the Spix's Macaws largely fed off the seeds of the " faveleira " (Cnidoscolus phyllacanthus) and the "pinhão"( Jatropha pohliana. 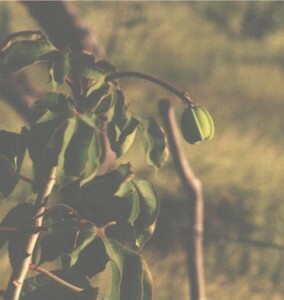 The fruits and seeds of other plant types, such as the "joazeiro" (Ziziphus joazeiro) or the " paudecolher" (Maytenus rigida) were also eaten by the macaws, but were less important. Faveleira and pinhao are the two plant species most frequently found in the region and their seeds are available for most of the dry season. Therefore it can be taken that the availability of food was not a limiting factor for the Spix's Macaw population. 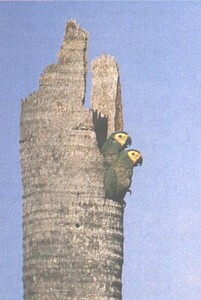 Trappers told us that the Spix's Macaws nested in holes in old crabeira trees. The breeding season was November to March and varied slightly according to the incidence of rain. There were usually two or three young and as they had a much smaller crop than other macaws of a similar size, they had to be fed more often than the young of other medium-sized macaws and the larger species. We discovered that traditional nesting sites were occasionally inspected by the birds throughout the year. The birds usually spent the night on the crabeiras along the little streams, but they did not always return every day outside the breeding season to these locations and were observed spending the night on a tall facheiro cactus (Cereus squamosus). Sometimes the macaws left the water courses for longer periods up to several weeks, but we could not discover where they were during this time. 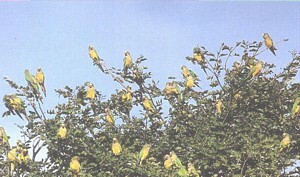 There are other parrots in the Curaçá region. In the same trees in which we observed the Spix's Macaws, we also saw Illiger's Macaws (Ara maracana), Blue-fronted Amazons (Amazona aestiva), Cactus Conure (Aratinga cactorum), Blue-winged Parrotlet (Forpus xanthopterygius). Another very common species, the Blue-crowned Conure (Aratinga acuticaudata haemorrhous) often visited the favelas to feed and must have come into contact with the Spix's Macaws. We only observed direct interaction with the Illiger's Macaws. Whenever the Spix's Macaws appeared, the Illiger's Macaws were unsettled and very noisy. Both species sat often together in the same trees. If an Illiger's macaw happened to sit on one of the Spix's Macaw's preferred perches, it was often driven off. The two species also bred occasionally in the same trees, but of course not at the same time since the Illiger's Macaws do not start breeding until February/March. The Spix's Macaws used only the biggest nesting holes. 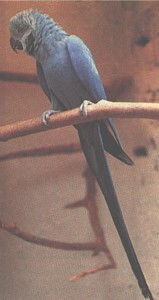 Smaller holes, which could still accommodate Illiger's Macaws, were insufficient for the larger Spix's macaws. Because of their habits, the Spix's Macaws were predictable birds. They used the same trees repeatedly and in the trees the same branches for perching. Even the flight paths between the trees and from them to the feeding areas were fairly constant. Pairs used the same nesting hole for breeding year after year. We were told that one of the traditional nesting holes was used by Spix's Macaws for over fifty years, although we naturally do not know whether the same pair used the breeding site for years on end or different pairs in different years. Our own observations of the last remaining pair seemed to indicate that certain pairs always return if possible to the same nesting site. It is this predictability and adherence to tradition, which sealed the fate of the species. They made it easy for the trappers to capture even the adults of this otherwise very shy macaw species. The findings provided here are based on information collected in the Curaçá region and refers only to the birds in that region. We do not know whether it applies to other populations. Obviously the behaviour and life-style of these birds will differ from any other populations in other regions, if the vegetation is different from that found in the caatinga in the Curaçá region - as it is, for example, in the cerrados in the " Gerais", the border area of southern Maranhão, western Piauí, western Bahia and north-east Goiás. The search for other populations of Spix's Macaws really is like looking for the proverbial needle in the haystack. If we just limit the possible distribution area to that in literature, information from ornithologists, bird enthusiasts and other interested parties, we end up with an area of approximately 300,000 sq. kilometres (115,000 sq. miles). The so-called Gerais lies in the region, where the four Brazilian states of Bahia, Piauí, Maranhão and Goiás meet and represents an area of roughly 80,000 sq. kilometers ( 31,000 sq. miles ). The vegetation here is a type of savanna with small trees called " cerrado", which are a intermediary step between the grass savannas called " campos " and the relatively thick, tall, forest-like tree savanna called " cerradao". Along the bigger rivers there are gallery forest areas and where the rivers rise you will find stands of buriti palms (Mauritia flexuosa), the so-called buritizals, separated from the surrounding cerrado by strips of open grassland. The different river sources are separated from each other by mountains or high plateaus called " serras". The waters of this region flow into three different river systems. The Rio Preto and its tributaries in western Bahia empty into the Rio São Francisco, the rivers in southern Maranhão ( Parnaiba, Parnaibinha, Rio Balsas and tributaries) and in south-west Piauí (Rio Corrente and Rio Gurgueia) belong to the Parnaiba basin and the Rio do Sono in north-east Goiás flows into the Rio Tocantins. 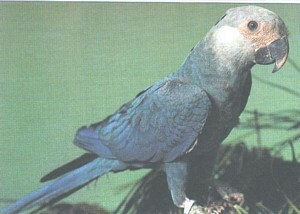 References to the occurrence of Spix's Macaws in this region come from Pinto (1978), who includes the region of the upper Parnaiba in the distribution area of the species, from Sick and Texeira (1979), who claim that three Spix's Macaws, confiscated in 1976 and now in São Paulo Zoo, came from southern Maranhão and again from Sick (1985), who in 1974 with his assistant observed seven Spix's Macaws in the Rio Riachao area, a tributary of the Rio Preto in western Bahia. 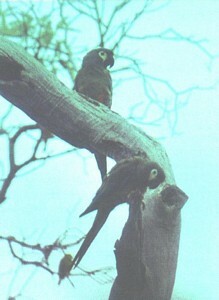 Brazilian bird enthusiasts also often mention southern Maranhão and north-east Goiás as a possible origin for Spix's Macaws and, as Keller (1987) wrote in his report for the Spix's Macaw meeting on Teneriffe, Filadelfia, Tocantinia and Pedro Alfonso, three small towns in north-east Goiás, are often named by knowledgable people in connection with Spix's Macaws. In March 1987 I was given more seemingly concrete information by the local people during a brief stop in the Corrente area and during a visit to the neighbouring southern Maranhão region that in the Parnaibinha region two to three Spix's Macaws were seen several times. During a later visit in March 1988 we met several people, who confirmed the occurrence of a small blue macaw in the region and we localised a number of spots along a 50 to 60 metre stretch of the Parnaibinha. However we found no evidence of its occurrence and the bird was unknown in the surrounding area. Renewed questioning in the Parnaibinha region in September indicated that the local people were no longer sure and we had to accept the possibility that observations reported to us were based on wrong identification. The informants had probably seen unusual blue parrots and had managed to convinced each other they had seen a small blue macaw. An attempt to confirm identification of the birds from illustrations seemed to suggest that they had in fact seen Blue-headed Parrots (Pionus menstruus), which occurred only seasonally in this region and in small numbers. The fact that the birds in question were seen eating mango fruit close to a house with Blue-crowned Conures(Aratinga acuticaudata haemorrhous) is more indicative of Blue-headed Parrots than Spix's Macaws. If we are correct in our supposition, then there is no direct basis for the occurrence of Spix's Macaws in southern Maranhão. In the above case two problems arose, which occur frequently with this type of questioning. a. Even when people are familiar with the common birds of a region, they often have problems in describing rare species correctly. Either they describe non-existent characteristics or completely overlook the obvious. b. Often it was not possible to stop the informants from influencing each other in the information they gave. So much information was coloured by that given in earlier interviews. In addition we were unable to confirm the reported sighting of the Spix 's Macaw in southern Maranhão, near to the border with Goiás in the area of Lizarda. We visited the Rio Preto region three times, for the first time in 1986, then twice in 1988, but were unable to penetrate the area, even with our own four-wheel drive vehicle, where Sick (1988) reported observing Spix's Macaws. In 1988 we visited different areas along the Rio Preto and its tributaries and even crossed the high plateau of the Serra Espigao and got as far as Dianópolis in north east Goiás. Despite intensive observation activity we did not expect to see Spix's Macaws because of the relatively short duration of our visit. But we did hope to find someone, who could confirm sightings in the region. Our hopes were disappointed, despite the people we spoke to having excellent knowledge of the local fauna. The search in north-east Goiás, in the region of the three small towns of Filadelfia, Tocantinia and Pedro Alfonso mentioned above as well as the catchment area of the Rio do Sono as far as the area of Lizarda resulted likewise in a blank. A Brazilian ornithologist informed us that in 1979 he had seen Spix's Macaws on a fazenda in the community of Manoel Emídio and that they had flown into a buritizal to feed. 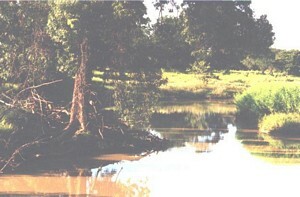 The region concerned can be regarded as part of the valley of the Rio Gurgueia, but few rivers in the area empty direct into the Rio Parnaiba. 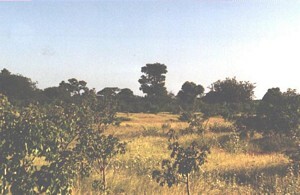 The dominating vegetation type is cerrado. 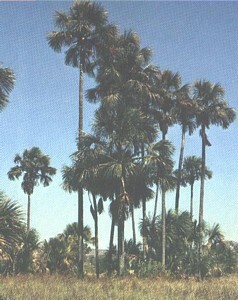 Buriti palms grow on wetter ground along small rivers and in parts are quite widespread. We came across localised areas of deciduous forest in wet low ground. The buritizals mostly immediately adjoined these wooded areas without intervening grass strips. In a few clearly demarcated areas drier caatinga-type vegetation dominated. It was interesting to note that the cerrado/caatinga vegetation distribution pattern was reflected in a mosaic-like distribution of the Peach-fronted Conure (Aratinga aurea) and the Cactus Conure (Aratinga cactorum). In July 1987 and again in January 1988 we travelled in the Manoel Emídio region. We visited the fazenda, where the birds are supposed to have been sighted as well as a number of other similar looking areas, without, however, seeing any Spix's Macaws or meeting anyone, who knew of these birds or could give us any information about their occurrence in the surrounding regions. One informant did tell us that several years before unusual, medium-sized macaws, which could have been Spix's Macaws, had appeared for two or three seasons, but had not been seen since. If this information is correct and it had actually been Spix's Macaws, it is possible to speculate that they lead a nomadic life in a few regions, turning up in a certain location for relatively short periods of time.This behaviour pattern would be the exact opposite of that observed with the Curaçá population and nomadic populations would also be much more difficult to trace. 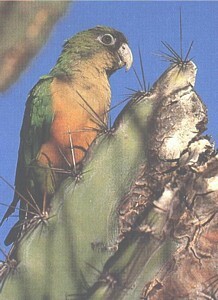 The Red-bellied Macaw (Ara manilata) occurs throughout the whole region of Manoel Emídio and can be sighted, depending on the ripeness of the fruit of individual buriti palms, sporadically in the buritizals. Red-bellied Macaws are, in my opinion, the birds most easily confused with Spix's Macaws, particularly in difficult observation conditions. As all the details provided by the observers there could easily apply to Red-bellied Macaws, a confusion between the two species can not be excluded. A Brazilian aviculturist, who keeps Spix's Macaws and therefore is completely familiar with them, wrote to inform me that he had information on their occurrence in the area around São Raimundo in Piauí. We got to know different parts of this community in several visits and included neighbouring communities in our investigations. We found the same type of caatinga vegetation in the south-eastern most point of São Raimundo Nonato and the neighbouring part of Remanso, Bahia, characterized by the predominance of Euphorbiaceae (giant succulents), which is so typical of the Curaçá region and it was not difficult to imagine that Spix's Macaws could occur there along the appropriate water courses. However we found no evidence of their presence and met no-one, who knew of Spix's Macaws. The main objective of the final phase of the project to find further populations of Spix's Macaws was not achieved. However it should be clear that at the present time only a positive result proves anything. Negative findings, even in relatively well explored areas, does not prove that the species does not exist in those areas. To put the results in perspective, we must remind ourselves again that the Gerais region occupies some 80,000 sq. kilometres (31,000 sq. miles) i.e twice the size of Switzerland. Moreover it is possible to come very close to a location where Spix's Macaws live, without people being aware of them. It is illusory to think that, given the means at our disposal, we could thoroughly explore an entire area of this size. In addition we know that the poachers active in the area, such as the wireworker in Petrolina and Floriano, were well informed about our movements and did their best to prepare the local people for our questions. The control activities of the IBDF in the last few years have also resulted in an increasing reluctance by the local population to answer questions on fauna in their region. We shall know in the next few years whether further populations of Spix's Macaws actually exist, which are known to the poachers (as they claim) or not. As the Curaçá population, which supplied until recently most if not all of the Spix's Macaws in captivity today, does not exist anymore, any birds coming onto the market in future must be from other populations unless it can be proved conclusively they are captive bred. For we can be sure that as long as there are people willing to pay absurd amounts for illegally acquired birds, the dealers and trappers will not hesitate to plunder further populations to the very last bird. - the Spix's Macaw is (was)without doubt one of the rarest parrot species and probably of all birds in the South American continent. - the one population known to us does not exist any more. The data obtained from observations on the last three birds of this population are insufficient for reliable information on their biology and habitat requirements. - the decisive factor in the extinction of the population was not habitat destruction, but quite clearly deliberate exploitation for the bird trade. Thus alleged bird-lovers are mainly responsible for the final sad result. - the negative results of our search for further populations is not proof for the non-existence of such populations. We can, however, say that if there are further populations, they are very locally restricted and comprise of a few individuals. 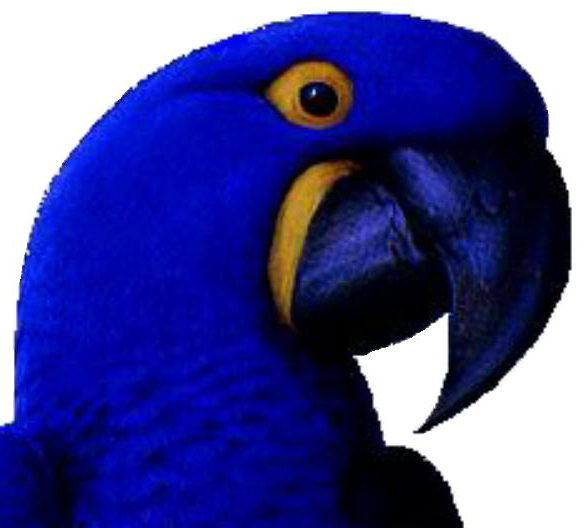 - Why is the Spix macaw so rare? The species was rare when discovered and occurred very locally. Which special circumstances determined population size and distribution? - Does the species still exist in the wild? Are there further unknown populations and how big are they? - How do we treat the observations of Reiser and Sick? Vegetation type and habitat structure in the regions concerned are very different to those existing in the Curaçá area and we need to find the populations in order to learn about their habits and requirements and complete the total picture for the species. - Is the Buriti palm, mentioned by various authors, important to the Spix's Macaw? It certainly was not in the Curaçá area, but may be in other regions. - Does the species suffer from genetic problems because of its long-standing low numbers. Could genetic drift or some other genetic mechanism have contributed to its rarity? - Finally we have established that even after completing this project we still have very sparse and incomplete information about the Spix's Macaw. It is very clear that the species has very little chance of surviving in the wild, even if there are further populations and the fate of this unique macaw, which belongs on its own in a category, is in the hands of a few aviculturists. Whilst at the beginning there was hardly any prospect of a co-ordinated breeding programme, it now seems that the fact there is no time to lose has helped to develop goodwill on all sides and solutions are beginning to surface. After years of failure to breed in captivity, they are again being bredsuccessfully. Hopes of the species surviving at least in captivity are today more justified than two or three years ago.